LinkedIn is associated with professional network building and mostly known as a great social media platform for recruiters to find ideal employees or for employees to look for jobs in the industry they are interested in. Statistics also show that high performing professionals use the social media platform to expand their knowledge from reputable sources and build their professional network. How can you, as a personal trainer use it to grow your online community? LinkedIn has over 500 million users and according to statistics, 44% of them earn over $75,000 in a year. Yes, you read that right. 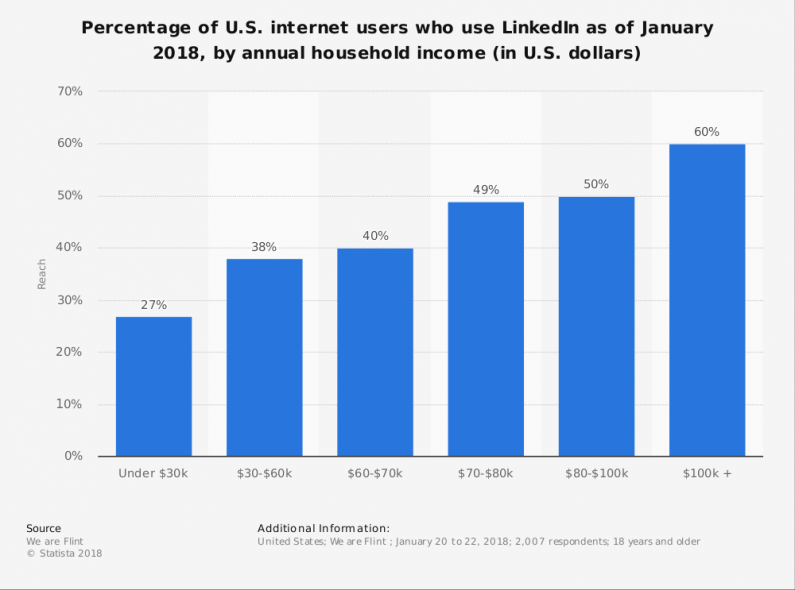 If you need some visual proof, here’s Statista’s chart on the income levels of overall Internet users from the US who use LinkedIn. As you can see, the more the income the higher percentage uses LinkedIn. If you’d like to position yourself as the expert personal trainer in your niche and your fitness business is targeting high earning professionals in a specific industry, including LinkedIn into your marketing strategy, and creating a professional brand image can be a winner move. Here are 5 steps to setting up your fitness brand on LinkedIn for accelerated lead generation success. LinkedIn allows users to promote their businesses as both individuals and as a company. This is extremely beneficial as it helps to appeal to different kinds of clients. In your personal profile highlight your own skills, education, qualifications, certificates, previous projects, work history and more. You can use your personal profile to talk about the type of fitness coach you are in a way that your ideal clients can relate to you on a personal level. In the professional profile, it’s best to make it brand-centric and display what makes your fitness business uniquely positioned to help your ideal clients. Here you can explain your USP, how that benefits your clients and helps them achieve their fitness goals. Feel free to put your existing clients in the spotlight (with their consent of course), their success and how they achieved them. If you run a company and have partners and a coaching team, create a place where you introduce them and their skills to your audience too. Use the same branded background and profile images you use on other social media channels so your fitness brand can be recognised. Highlight specific areas of your profile to catch prospect attention. For example, if you’ve won any competitions or have taken part in international tournaments, highlight the ‘Achievements and Certifications’ section to be visible on top of the page. Keep ‘Profile Summaries’ and ‘Speciality Skills’ separate. In your profile summary, write a keyword-infused copy talking about yourself/your business. This helps with SEO optimisation. In your skills section, mention all the fitness-related qualifications, skills you acquired either via education or hands-on experience. Build a network of both professional and personal acquaintances on each profile. Your professional network will help increase your brand visibility in other target markets, while your personal network is excellent for focused fitness marketing. Finally, always use a CTA at the end of your profile to encourage readers to get in touch. Endorsements on LinkedIn are often two-way streets and can help brands market themselves quite effectively. If you were to endorse someone, chances of receiving an endorsement from them or have them engage with you online are higher. Both scenarios can get you attention, contact, and conversions. The rule with LinkedIn endorsements is 'quality, not quantity.' Identify people you’ve worked with in the past, have interacted with physically/online, and ideally who are renowned amongst your target customer group. Recognise people who have set good benchmarks and are implementing excellent industry practices. Your equipment suppliers, active wear brands you or your online clients use and deem good quality, athletes, coaches and nutritionists, and even other personal trainers and gyms you know in person are some of the people you can endorse. All these parties will likely have access to a large following base and when you endorse them, you appear on their profiles and become visible to their followers. This can be a great opportunity for increasing your brand visibility. The campaign manager has a very user-friendly account management system which helps users create advertisements, choose target audiences, promote content, and track engagement with ease. Campaigns covering various budgets are available, making LinkedIn ads cost-effective and helpful for even small business owners. Ideal even if you are just about to launch your online personal training services. One more thing to keep in mind is that 58% of all LinkedIn users access the platform from mobile devices. Be sure to optimise your ads for mobile. According to statistics there are 87 million LinkedIn users in the millennial age group and 11 million of those are in " target="_blank">decision making positions, meaning they are high earners. If that’s your target market, focusing on content that speaks to Millennials can be the ideal lead generation strategy for your online fitness business. Studies show that millennials are more likely to consume content that is educational, inspirational, and which helps them develop their skills. Keep this in mind when creating LinkedIn articles. Use their most burning fitness related problems to inspire your topics but do your research and create the article to educate and inspire, rather than trying to sell. We recommend you utilise LinkedIn’s publishing platform to establish your thought leadership in the fitness industry market space of LinkedIn. LinkedIn groups are excellent places to find clients and partners for your online personal training business. When in groups, you can easily interact with industry experts and peers, show off your knowledge and skills, and engage with prospective clients. Asking questions, especially open-ended ones can increase the engagement of a specific post, so feel free to use them in your headers to grab the attention of the reader. Feel free to get in touch if you're considering PT Distinction for your new online personal training business or if you have any questions about the features.